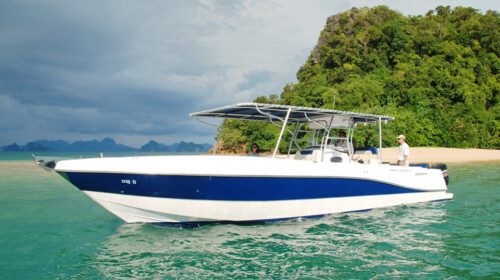 This 78 ft Sailing Catamaran is available for private party charters in Phuket. Party Boat Phuket Charter with Boat in the Bay. Our brand new 78 ft sailing catamaran is a perfect venue for your next event, whether it’s a corporate party, a birthday party, pre or post wedding party – the options are unlimited. The catamaran is so spacious it can accommodate up to 98 people in style and comfort. Come aboard and chill in our cabana-style seats, day beds or sun loungers and enjoy a leisurely cruise around the islands. Treat your palate with our refreshing cocktails while savoring delicious hors d’oeuvres served throughout the day. Set the mood with our lounge music and cool down with our exhilarating water slide. Watch the majestic sunset and take your dance moves to the next level with our DJ’s club mixes. We offer 2 itinerary options for private day cruises. You can head south to the islands of Khai and Naka. Enjoy snorkeling with colourful fish, try a real bottom fishing, relax on a white sand beach. This is also a good itinerary if you are looking for some extra entertainment like jetski, banana boat etc. We can stop at one of the islands with all these activities offered ashore. Another itinerary option is visiting Yao Yai and Phanak Islands. Have fun at Yao Yai: go for a swim and cool down with our exhilarating water slide. Let’s play some water jousting games or simply lounge around and enjoy a drink or two. And at Phanak get your camera ready for the spectacular views on the limestone cliffs. Onboard amenities: Funktion One sound system (the best in audio sound systems), light system that syncs with the music, Pioneer DJ equipment, large dance floor, outdoor shower, toilets. 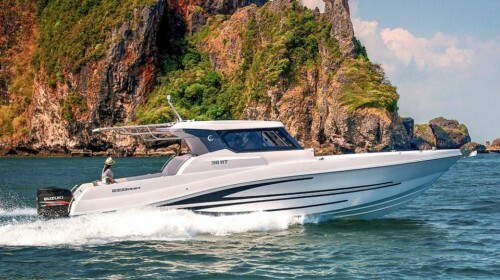 Contact Boat in the Bay today for charter inquiries on this Sailing Catamaran 78 and other party boat charter options in Phuket.